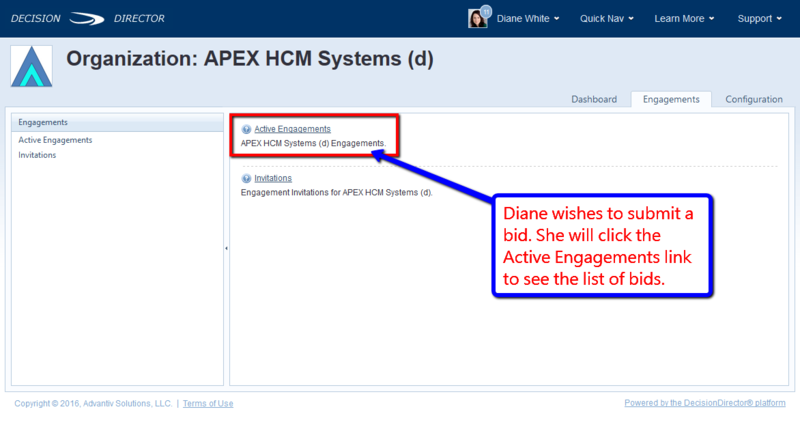 Select the bid from the list of active engagements. Confirm that the bid is eligible for submission. Go to your dashboard. Click the Engagements link for your company. The click the Active Engagements link. This will reveal the list of active engagements. 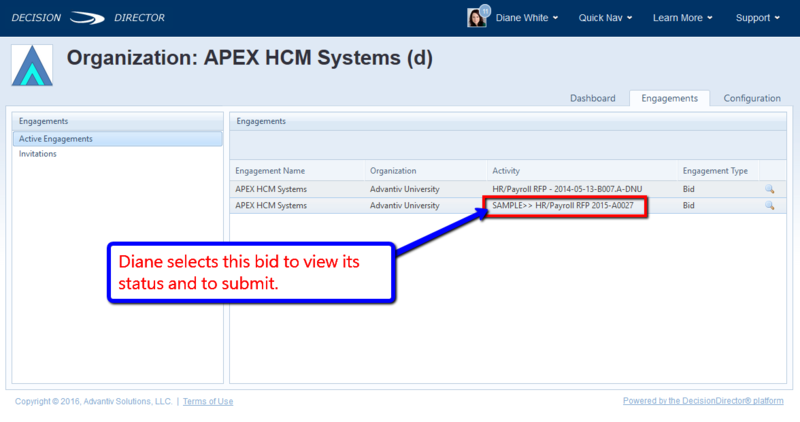 Choose the bid you wish to submit by clicking on the its entry in the list of engagements. The Progress Tracker tab shows the status of the bid. Only when all required items are answered, and only if it is still prior to the due date and time, may a bid be submitted. If these two conditions are not met, then DecisionDirector will not display the Submit link (pointed to by the arrow on the right). Click the Submit link to submit the bid. You will be prompted to provide an internal note for the submission log. The customer will not see this note. Once submitted, the bid can be viewed but can no longer be modified, and the Submit link will now become the Unsubmit link. The customer will have view-only access to the bid once the due date and time arrives, and never before. Should you wish to revise your bid after it has been submitted, you may do so only if it is still prior to the due date and time. 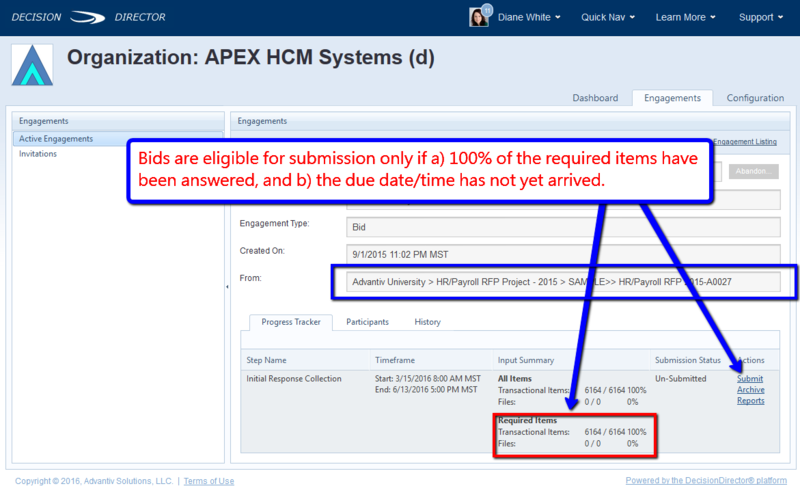 You will click the Unsubmit link to return the bid to unsubmitted status, and you and your team may revise the bid. Of course, if you decide to no-bid after you have submitted the bid, you may unsubmit it, provided that you do so before the due date and time. Unsubmitted bids are never seen by the customer. IMPORTANT NOTE: If you Unsubmit a bid in order to revise it, you must Submit the bid again if you intend for the customer to receive it.